From the moment you launch Fluttabyes and the game’s logo starts dancing to the incredibly cheerful theme tune, it’s almost impossible not to start bobbing your head along with it! 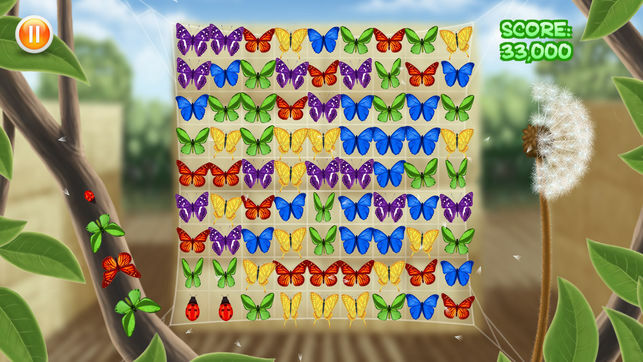 Matching butterflies earns you time as well as points and when the matched butterflies fly away, the grid is filled up again. Your time remaining is represented by the seeds on a dandelion; when all the seeds have blown away: it’s game over! If you match enough of a certain colour then you can earn a bonus Ladybird and if you match the maximum possible number of butterflies, you earn a Rainbow Butterfly. This could also be called “Survival Practice” because it’s the same as Survival but without the time limit. This is a great place to learn how to earn the Ladybird and Rainbow Butterfly and then see what effect they have on the game grid. In this mode, when you successfully make a match and the butterflies fly away, they are not replaced. Your goal is to clear the grid of all butterflies as quickly as possible. Butterflies fall from the top of the grid at an ever increasing rate. It starts off slow but after approximately one minute it can get quite hectic! The aim is to last as long as you can. In the final game mode, there is a fixed time limit of 60 seconds to obtain the highest score you can. To help you, the bonus Ladybirds and Rainbow Butterflies are easier to obtain. All game-modes have an associated Game-Center Leader-Board so you can compete with your friends and all other players around the world. If you want to try-before-you-buy there is a free version of the game called “Fluttabyes Free” which limits you to 60 seconds of Survival mode.